The main character, Josette, delights in the silly stories her father tells her. For example, he introduces a girl named Jacqueline, whose father, mother, brother, friend, and toys are all named Jacqueline. Or in the second story: "So Papa teaches Josette the real meaning of words. A chair is a window. The window is a fountain pen. A pillow is bread and bread is a bedside rug. . . ." In the other stories, he takes her on a plane ride to the moon and sends her on a wild goose chase in the house while he shaves. While children will delight in the silliness, underneath the absurdity is the familiar comfort of a loving family: parents who stay up too late and find ways to entertain their daughter in the morning; a stylish mom who worries about her husband's flights of fancy; and a father who nurtures his daughter's creativity and delight in the world. 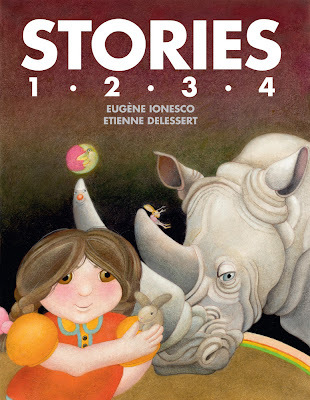 Adding to the charm and surrealism of the stories are over 100 wonderful illustrations of Etienne Delessert, including rhinoceroses, giant eyeballs, giant mushrooms, and teeny airplanes.